Water nearly covers a home Thursday in Vicksburg, Mississippi, where 600 residents had been evacuated as of Thursday night. (CNN) -- The U.S. Army Corps of Engineers could open the Morganza Spillway as early as Saturday, Louisiana Gov. Bobby Jindal said Friday. The Mississippi River Commission has directed the Corps to operate the crucial spillway once river flows reach a certain trigger: 1.5 million cubic feet per second. Projections indicate the tipping point could be hit as early as Saturday evening, Jindal has said. Opening the spillway would lower anticipated cresting levels along the lower Mississippi River and divert water from Baton Rouge and New Orleans but would flood much of low-lying south-central Louisiana. Seven parishes are expected to be affected by the opening, according to the Corps. The Mississippi River Commission has advised a "slow opening," and the flood would spread gradually over several days, the Corps said. The Morganza Spillway has not been opened since 1973. Louisiana state and local officials braced for the possibility of major flooding in the Atchafalaya River Basin if, or when, federal authorities open the spillway north of Baton Rouge. They advised residents to expect road closings. The National Guard worked around the clock to construct a flood barrier in Morgan City, Louisiana, where the Atchafalaya River was already 3.15 feet above flood stage, according to the National Weather Service. The strategy in Morgan City, officials say, is to reinforce the levees around the city. That's where efforts were being focused Friday, rather than on handing out sandbags to individual residents. Officials believe that the levees will protect the city from flooding, but some are taking preliminary precautions, she said. At Sacred Heart Church, where Bertaut works, people spent the day moving important documents such a baptismal, marriage and financial records to the second floor. Meanwhile, in the Arkansas town of Helena, the river crested at 56.5 feet -- 12.5 feet above flood stage, according to the National Weather Service. Jindal urged southeastern Louisiana residents to evacuate. "Now is the time to take action," he said. The U.S. Coast Guard said floodwaters could close the Mississippi River to ships at the New Orleans port as early as Monday morning. The National Weather Service said that as of Friday morning, the river was at 16.8 feet in New Orleans, just a fraction below flood stage. It is expected to crest May 23 at more than 19 feet. The New Orleans levees are built to withstand 20 feet, according to the weather service. Upriver in Vicksburg, Mississippi, Police Chief Walter Armstrong said 600 residents had been evacuated as of Thursday night. The river was expected to crest at 57.5 feet. Flood stage at Vicksburg, the level at which the river may begin flowing over its banks, is 43 feet. Armstrong said he expected higher water Friday, with more homes affected. More than two dozen roads were closed and about 45 businesses will be closed by Friday. In Arkansas, the Farm Bureau estimated that damage to the state's agriculture could top more than $500 million as more than 1 million acres of cropland are under water. "It's in about 10 feet of water," Dyersburg, Tennessee, farmer Jimmy Moody said of his 440 acres of winter wheat, which was to be harvested in the coming month. Other farmers in Mississippi, Missouri, Tennessee and Arkansas rushed to salvage what wheat they could ahead of the rising water. As for corn, farmers who were able to get into the fields during a soggy planting season in late March and April are seeing their crops in some cases under several feet of water. Some officials said Thursday that spillover effects resulting from the flood could threaten other industries. That includes the possibility that the Waterford 3 nuclear power plant in Taft, Louisiana, could be closed, according to CNN affiliate WGNO. The Mississippi River is expected to crest at 26.6 feet in Taft on May 23. If it reaches 27 feet, officials told WGNO, the plant's water intake system could shut down. Carl Rhode of Entergy, the plant's operator, told WGNO that the threat to the intake system is not a matter of nuclear safety. However, Scott Welchel, a St. Charles Parish Emergency Operations Center official, said shutting down the plant would have a "domino effect" on local industries. "It would impact every industry along the river," Welchel said. "That's just something that isn't easy for people to deal with, especially on a moment's notice." For residents in communities along the river, the damage has been far more devastating than can be measured in dollars and cents. 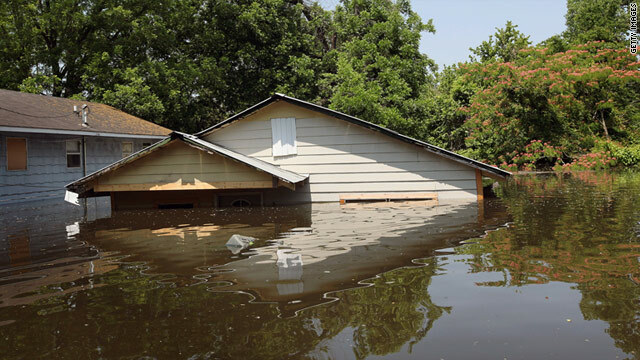 Danny Moore of Millington, Tennessee, told CNN affiliate WPTY that the recent disaster marked the second time in one year that flooding took away nearly everything he had. Moore said that after a flood destroyed all of his furniture last year, he decided to move everything he owned into rented storage space. However, those belongings were destroyed when his storage unit was flooded several days ago. "They say bad luck comes in threes. I hope this is the end of it," Moore told WPTY. The Millington resident said he lost a house to a fire in 2009. Moore said he is too preoccupied with taking care of his girlfriend, who is suffering from an infection that is damaging her liver, to look for new furniture. "We'll do what we've got to do and keep praying," Moore said, holding back tears. CNN's Mariano Castillo, Mia Aquino and Erica Henry contributed to this report.